PokerMedia Australia are proud to announce an exciting partnership with our friends at Aussie Hold’em Poker for the upcoming Newcastle Poker Championships (NPC). The annual Championship series will be held from June 6 – June 15 with the Main Event to be held on Saturday, June 14 – brought to you by PokerMedia Australia! 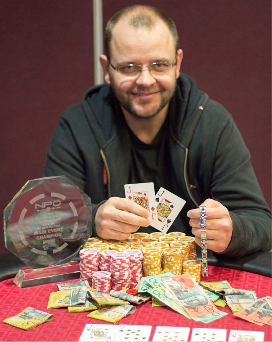 A year ago saw Nathan Bevan (pictured) pocket the first prize after being crowned the 2013 Aussie Hold’em NPC Main Event Champion. Bevan joined recent winners Ken Curry (2010), Dean Allison (2011), and Mick Gallen (2012) in making NPC history. 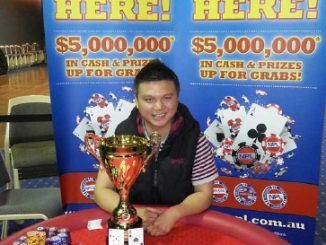 Held each June for the past eight years, the NPC was moved to Club Macquarie in Argenton in 2011 and has enjoyed continued success through their mutually beneficial relationship with Aussie Hold’em Poker. Club Macquarie has been staunch supporters of the event and players have appreciated the flexibility in being able to allow each event to draw to a natural conclusion. In essence this year be no different, where each tournament will end at different times over the ten days. This means relaxed blind structures with plenty of levels and lots of time for players to play. 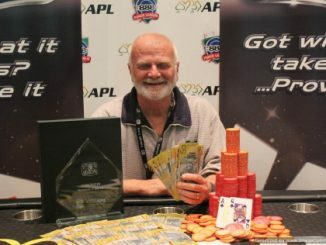 Those interesting in joining the fun in Newcastle can do so by qualifying through satellite events (see website for details: http://www.newcastlepokerchampionships.com.au/ or http://www.aussieholdempoker.com.au/index.cfm?a=TaE_NPC) or by registering direct. Club Macquarie also provides on-site accommodation from $99 twin share if you’re keen to stay and play multiple events. PokerMedia will be providing regular updates throughout the Championships with thanks to Aussie Hold’em Poker, so check our news and facebook pages regularly. We will also be providing live reports from the PMA Main Event on Saturday, June 14. Starting stack 2000; two-day event; rebuys: 2,000 for $10 – players can rebuy anytime during the first three levels of play if they are on the starting stack or less; Add-on: 2,000 for $10, 5,000 for $20, 10,000 for $30 – players can add-on at the first break as long as they are still in the tournament. Starting stack 8000; $50 from each entry goes to the main prize pool, remaining $25 is each player’s bounty; no re-entry, lifelines or rebuys. Starting stack 5000 per player; $66 per team + 2 x $30 lifelines; combine stacks after first break. Starting stack 10,000; $66 with optional $63 re-entry. Starting stack 5000, 2 x $30 lifelines. Starting stack 5000; 2 x $20 lifelines. Starting stack 7000; optional $52 re-entry. Starting stack 5000; capped at 72 players. Starting stack 20,000; optional $210 re-entry; $40,000 anticipated prize pool. Starting stack 30,000; optional $525 re-entry; capped at 32 players. Starting stack 5000; 3 x $10 lifelines.